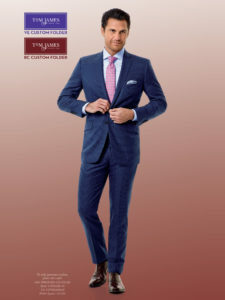 The Men’s Royal Classic custom clothing collection features new silhouettes for Suits and Sport Coats. The ultra-trim men’s fashion has been relaxed with slightly fuller jackets and roomer trousers. We are not talking about the oversized baggy look but just a relaxing that makes the garments more comfortable to wear. In Men’s Sportswear its great to live in Tampa Bay area since we get to wear these garments practically year round. You will see a splash of color with well coordinated shoe and belt combinations.